The line goes immediately into twin tunnels south of Mudchute, which would force trains to share a single track all the way to Greenwich, which would seriously limit frequency. So they've come up with a clever wheeze whereby trains from Mudchute reverse at Island Gardens. Meanwhile, trains from Lewisham reverse in the other platform there, using the normally-northbound tunnel under the Thames in both directions. The service is so fucked they're running rail replacement buses while it's open, and the leaflet accompanying the disruption also suggests using the Greenwich foot tunnel, a Thames Clipper, even an East London Line replacement bus - anything but the DLR. TfL have gone so far as to invent a whole new bus route so you can avoid the DLR completely. This phase of disruption lasts until August 25, and disruption in general lasts until ca. 2010 when all the various projects should be finished. With nothing but the probably-undisruptive Dagenham Dock extension on the horizon, you may even get some time to enjoy the upgrades. On the plus side there is 5 minute service between Stratford and Poplar for most of the day (from 6:30 AM until 7:30 PM, I think). Still, I'm happy that I don't have to use any part of DLR anymore. From what I gather, the reason they couldn't run a 5 minute Stratford service before was lack of trains. With fewer services to run no, it's no longer a problem. 1)Tower Gateway closure - which reduces central terminating capacity. 2)West India Quay junction works. 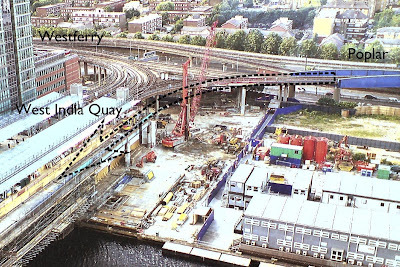 The Westferry-WIQ flyover is consequently out of use and requires Westferry-WIQ trains to continue ahead and cross over on the flat at the old delta junction. The effect of this is to restore a flat junction where the Westferry-Poplar trains branch off, limiting the total number of trains that can pass from Westferry to either WIQ or Poplar (as compared with the grade separation provided by the previous flyover). 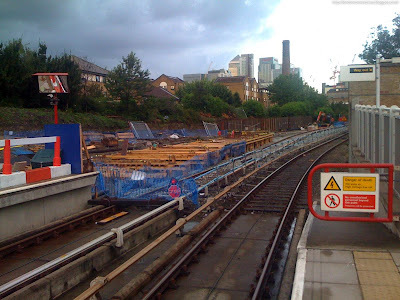 3)Work to construct a grade separated junction at Canning Town. This knocks out the WB line from Royal Victoria-Canning Town, until it is replaced by a flyover to carry it (and the EB line) over the lines it would otherwise conflict with (i.e. Woolwich-Stratford Intnl and vice versa as well as the EB Bank-Woolwich line). 2)The WIQ flyunder is constructed and grade separation is restored for Westferry-Poplar and Westferry-Canary services. 3)Grade separation work is completed at Canning Town enabling restoration of the line from Royal Victoria to Canning Town. Despite what sounds like a chaotic set of changes at the moment, unless I guess you live south of the Isle Of Dogs and thus have to change several times to get where you want to go (see below) then most of the time things run smoothly. Except of course for the odd occasion when things go wrong. Not helping are the almost weekly closures of the east end of the Jublilee line which, due to the availability of the DLR in the area, is not covered by replacement bus services. DLR trains. Except a couple of weeks ago nobody seemed to compare notes and the Canning Town stretch of the DLR was also closed at the same time. Thus the replacement bus services laid on by the DLR were not only having to cope with the passengers who would ordinarily take the toytown trains, but also the tube passengers who had been displaced onto the DLR. Needless to say at times it was utter bedlam. Then there was last Saturday evening when, with the tube closed all the way to Green Park and the DLR services in and out of Bank having to cope with every passenger from E16 who wanted to go to town, they decided to roll out an upgrade of the signalling software. At around 8pm this fell over completely, leaving trains stranded in tunnels and even the captains baffled as to their ultimate destinations until the system rebooted. I happened to be on a KGV train from Bank at the time and heard the captain make the memorable announcement at Westferry, advising passengers going to Lewisham that they should change there, take the next train to Canary Wharf, change again to a train going to Island Gardens and finally cross the platform to take one more train that would take them to Lewisham. An excellent piece. You have accurately captured the key point - the DLR service is royally screwed. For people like me, who live on the south end of the Isle of Dogs, the service is effectively unavailable for most of the day. You need advanced queue barging skills to even hope of fighting your way onto a train on the single track service section, and even with those skills you still rarely succeed in getting on. Horrid. Last night was an absolute gem. A traffic accident caused traffic gridlock, so the new/replacement buses on the Isle of Dogs could not move in any direction. It would probably have been easier if I jumped into the Thames and tried to swim home. The comments above by groupie. Second point doesn’t quite make sense to me. Yes, the junction has been reconfigured just east of Westferry station. Yes - new tracks have been installed to create a new eastbound route to WIQ using that junction. However, I don’t believe that trains can use this new route yet. The eastbound track between that junction and WIQ is not connected. Last time I looked there were missing sections both next to the flat junction and also at the delta junction site. Admittedly, I haven’t looked at the track work in the last few days – but as there wasn’t a closure last weekend I doubt they’ve had a slot to plug those gaps yet. Yes anonymous that's true, but I don't think that's how the plan was meant to run. Clearly 1, 2 and 3 were meant to occur simultaneously to make best use of the service restrictions. Point 2 will be the case soon enough. If not already, Westferry-WIQ trains will eventually have to stop using the flyover east of WIQ because (if I understand correctly) the flyunder will be constructed using a bit of the existing flyover... so eventually they will have to continue along the old viaduct and cross on the flat, alongside the WIQ-Westferry trains, no? Yes - (2) isn't true yet, but it definitely will be shortly, because as you say the flyover will be getting some serious remodelling. (3) also isn't true yet - or at least it wasn't when I visited at the weekend. Trains from Beckton were arriving on the westbound City Airport-Canning Town track, and only switching to the eastbound using the crossover immediately south of Canning Town, where they terminated and reversed. There are also those (not uncommon) weekends where TfL closes the Central line from Leytonstone to Liverpool St at the same time as the Jubilee line is closed from Stratford to N. Greenwich (Sundays 8 and 15 June being recent examples) thus leaving the main line rail service from Liv St as the only way of reaching Stratford other than by (fragmented)DLR. Weekend travel to or from virtually any E postcode seems never to be easy at the moment. Imagine the confusion and scepticism of an Oyster PAYG user going from, say Holborn to Snaresbrook: "Yes sir, you touch in here, out at Liverpool St Underground, in at Liverpool St main line, out at Stratford, get the replacement bus to Leytonstone, touch in again there and out at Snaresbrook and it will only charge you for one off-peak z1-4 journey." "Oh yeah, really?" One thing I've always wondered: why do DLR service maps still have the arrow-heads for interchange stations, when the Tube ditched them years ago? I'm glad they keep the interchange arrows, and wonder why LUL got rid of them. They're meant to be a visual abbreviation for imagining the other line(s) indicated are travelling through the interchange spot at right-angles to each other. In other words, to make it look like a little bit of cut-away from the full map. 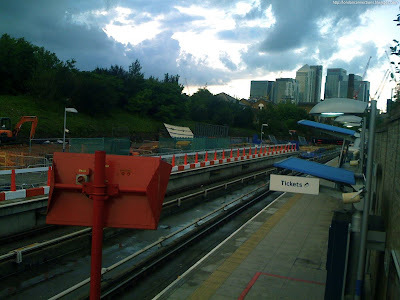 The annoying part for Beckton line passengers is not that there is no service to Tower Gateway or even Poplar - the really annoying part is that they've timed it so just as the Beckton - Canning Town train arrives at C Town, your connecting Bank train coming KGV is pulling away. It's enough to have made me take the Jubilee every day.